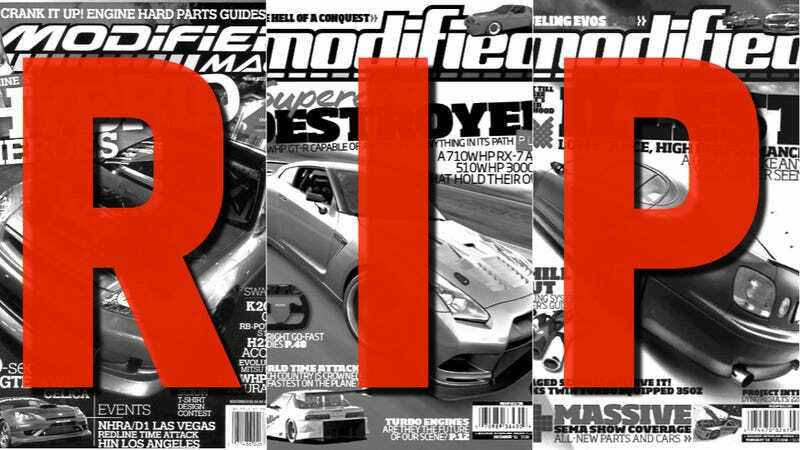 Source Interlink, which owns Motor Trend and Hot Rod magazines, has shuttered Modified magazine, fired its editor, and is rumored to have let go of as many as 100 people from other publications according to sources. Modified, which is part of the "Tuner Group" of Source Interlink magazines, focuses mostly on modified cars as the name suggests. Particularly, there was a strong focus on Euro and JDM tuner vehicles — especially the Nissan GT-R.
Its editor, Peter Tarach, was allegedly let go yesterday and told the magazine was closing. We're also told that dozens of employees from other magazines — including Truck Trend and Hot Rod — were also cut, although there's no confirmation on that as of yet. The rumor is that advertisers aren't renewing contracts, circulation is dwindling, and splits within the company are making it difficult to operate. We've also heard that the expectations that Motor Trend's YouTube channel would be self-supporting weren't met and YouTube shut off all the money they were spending on it. It's been alleged that Motor Trend and Hot Rod are keeping the company going while they wait for a Motor Trend/MSN deal to come to fruition — although, it's worth noting that we've heard rumors that's been a problematic transition as well. While banking on MSN in the long run has seemed a curious bet, there could be a lot of money (and traffic) to be had from the arrangement in the short term. Nevertheless, Motor Trend has a strong digital presence and a popular YouTube channel so it would probably be wrong to assume this means they're currently at risk of also going away, though we've heard there might be some belt-tightening there, too. If you're a former (or current) Source Interlink employee, please share any information you have below.